…on Procession day, residents don their creative expressions and proceed through the streets of Olympia in masks and costumes. 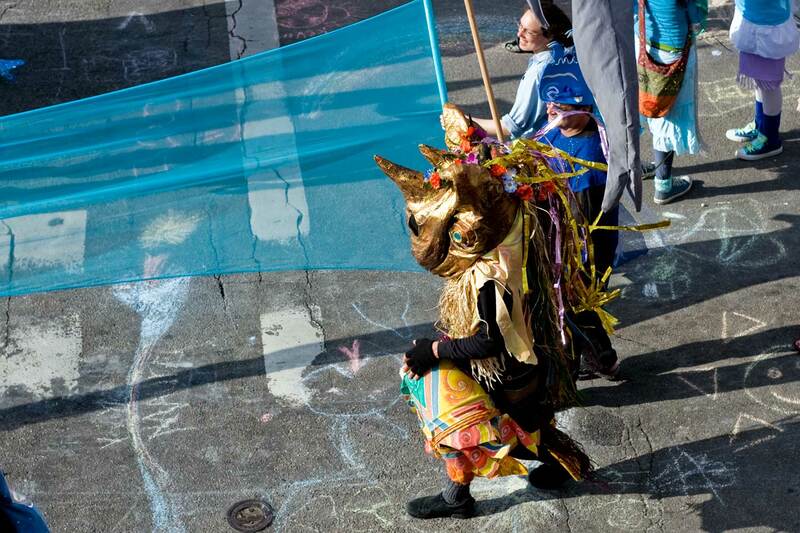 Carrying banners, windsocks, and giant puppets, they participate in a cultural exchange honoring the awe and splendor of the natural world. Congratulations to all involved in this glorious event! Thanks much for leading me – and anyone else fortunate enough to click the link to Cysewski’s Seattlescapes – to these often uncanny photographs. One of them shows Steven Cysewski posing in a small cubby articulated with mirrors reflecting the infinity of the place and with Cysewski at the center holding his 35mm camera. I surely recognize him – or do I really? He “seems familiar” but more than that. He had the eye didn’t he? It is a pleasure to admire such sensitivity to subjects and compositions. These choices of his redeem our often drab business district, but only within his frame. I recognized most of the subjects, and a few of them intimately. With exceptions the subjects are seedy, “flowers of decay.” For instance the abiding trash of Belltown. We learned this modernity from Baudelaire – I think. “flowers of evil.” I recognize the man with the beard in the overalls, near Westlake Mall. He is the only one I remember. It was when Steven took to wandering with his sensitive camera that I was beginning to study the city’s past more than its streets. And except for the few charmed places like the Market, the waterfront and Pioneer Place (or Square if you prefer) I was then ready to leave our broadly ugly contemporary business district for its past. The truth is that except for those favorite haunts, I knew little about the blotted Central Business District before I started studying Seattle history. But I make exceptions for the messes of St. Vinnie’s and Steven’s recording of that is very stirring. Bless him certainly. So Paul, I am more comfortable eating bark in the forest and sleeping with my oysters on the beah, but I have logged in anyway… am not sure what to do now. I’ll wait a while and see if something happens.